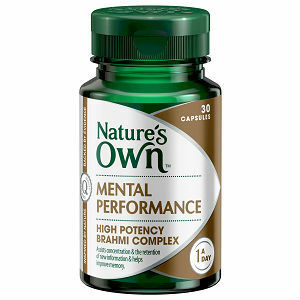 This is a review of the supplement Nature’s Own Mental Performance. This product plays a significant role in improving cognitive processes, information retention ability, learning, and the ability to memorize. It also assists with concentration and stamina. You will learn more about Mental Performance as you read more. Brahmi– Assists users in retaining new information. It also plays a significant part in improving memory and learning. Korean Ginseng – helps to reduce stress, as well as mild anxiety. Users should take one capsule with meals on a daily basis. One bottle of this product contains 30 capsules, which means that a bottle lasts for 30 days if used by a single user. Users may also take this product based on the prescription of a health care professional. It is advisable to consult a health care professional in case of persistent symptoms. Mental Performance is suitable for students and adults in times of high workloads. The manufacturer has not included the price of this product on the official website. However, after looking for the price from different sources, one bottle will cost you approximately $12 per bottle. Assuming that this is the actual price in the market, then it is a relatively low price. Potential buyers are likely to wonder whether this is a quality product because its price is extremely low compared to the price of other products with similar functions. It is important for the manufacturer to provide a satisfaction guarantee as an indication that the product is of high quality. The manufacturer of Mental Maintenance has not provided such a guarantee. The lack of this guarantee increases the possibility of new consumers questioning the quality of the product. They might be afraid that they may lose the value of their money if the product does not satisfy their needs. It is also worrying that we did not find any customer reviews for this product. The lack of such reviews may hinder new users from purchasing the product because they are not sure whether those who have bought the product have experienced the alleged effects. Mental Performance claims to help in improving cognitive processes, information retention ability, learning, and memory. Users may trust this product based on its ingredients most of which are approved. Most of these ingredients are known to have significant effects on the brain and are important ingredients in most products that focus on the brain and related functions. Furthermore, users may trust this product because most of the ingredients come from natural sources. Natural ingredients are usually safe making this product safe for consumers. However, new users may be concerned about the quality of the product due to several indicators such as a low price, the lack of a money-back guarantee, and the lack of customer reviews. Moreover, there is no information about the possible side effects, which may also be a concern for some consumers. Henry Costa	reviewed Nature's Own Mental Performance	on June 14th	 and gave it a rating of 2.